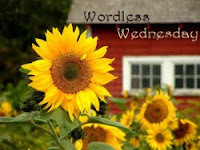 Now, over on Sunday Shutterbugs, the theme is Art. They're doing something new for 2010 where they do a letter of the alphabet for two weeks and then move onto the next letter. I'm looking forward to some very interesting themes this coming year. Plus, you know me, I have to confess that this isn't a new picture. It's one I took..umm...wow, thank you flickr for knowing this, June 29, 2004. 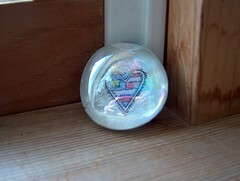 It's a marble magnet and I used to love making these. I still do, actually. It's tougher now to find the marbles than it used to be but I still love them and let me tell you, they're great for using on the fridge to hold up artwork and such. Now, the reason I posted this picture is because I wanted to be sure that I put something up today. Plus, I want to take my camera out with me today when I go into Lansing. You never know what you might find so I'm hoping to actually have a second picture to post later today when I get home. Thanks for playing along Katie!